During more than a century of teaching, Brillantmont has undergone several significant changes. Each subsequent generation of the founding family has overseen developments either in the school’s physical appearance or in its curriculum or teaching structure. In 1948, one of the first changes saw the school's curriculum move from a French-language programme to ones based on British and American programmes – pre-cursors of ones we run today. The 1960s also brought change, with the introduction of a co-educational day school to the previously girls-only establishment. Change was to come again in 1992 when the boarding school became co-educational, and in 2011 with the relatively recent opening of the Middle School, enabling Brillantmont to cater for younger students. In 1976, a significant development in the running of the school saw its two separate parts – the Chateau Brillantmont and Villa Brillantmont – united when Philippe and Françoise Frei-Huguenin sold off land to buy a greater share in the school from their cousins. Without this move, Brillantmont may not have survived to today, as the cousins had planned to close the school. 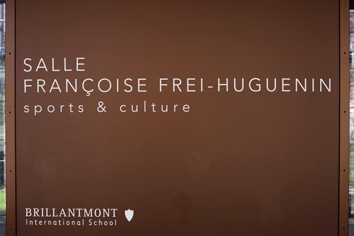 Françoise Frei-Huguenin, who was the granddaughter of the school’s founders, went on to spend several decades leading the school before sadly passing away in 2007. More recently developments at the school have focused on making sure the buildings and infrastructure can fulfil the needs of modern students. Beginning in 1995, the school undertook an extensive renovation programme, refurbishing rooms and improving the student bedrooms at the boarding school. In 2003, a school-wide virtual campus was introduced allowing parents and students to interact via the internet. This was further developed in 2009 with a new website and the introduction of live grade books and online homework. One of the most significant changes for the school in recent years has been the opening of a new sports and performance hall – the Françoise Frei-Huguenin Sports and Culture Centre. The need for more space for students to take part in sports and fitness activities and for drama and music created a dilemma for those running the school. It was imperative to create more space, but without spoiling the picturesque setting of the school or destroy any of its historic aspects. To achieve both of these outcomes, Brillantmont commissioned an innovative underground sports hall and work began in 2011. Around 10’000m3 of soil was dug out from underneath an existing sports court to accommodate the new building before careful landscaping restored the site above ground. Work was completed in June 2012 and the hall was officially opened in October the same year. It now houses a music studio and a 100m2 stage, and offers facilities for team sports such as basketball and football, indoor athletics and fitness activities including weights and aerobics sessions. The hall has been named the Françoise Frei-Huguenin Sports and Cultural Centre in honour of the woman who shaped the school for so many years.